After taking the boys to see The Wedding Singer and The Lord of the Dance, which they both enjoyed, we've decided to spend time taking them to see more plays and musicals. 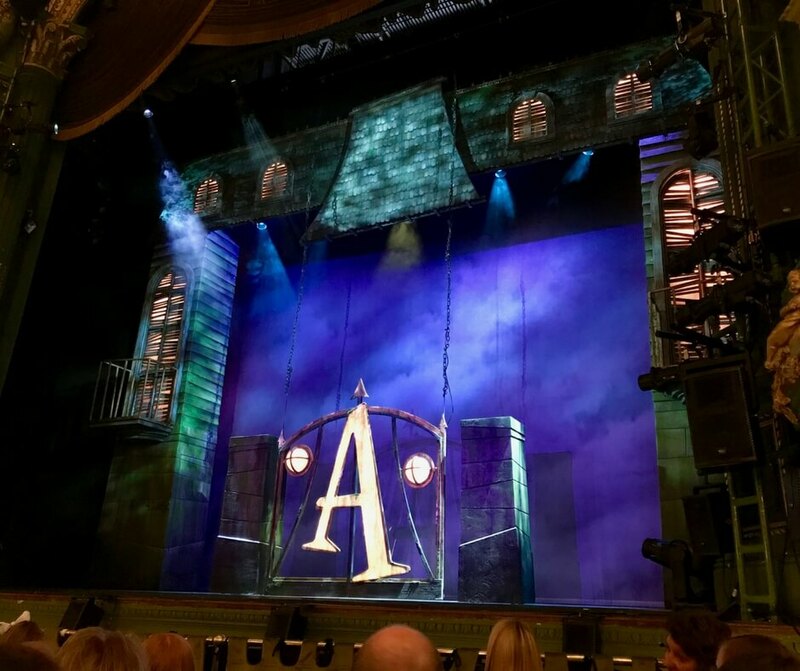 Last week we saw The Addams Family and before the Hubby booked it I had no idea it was a musical. As the Theatre Royal in Nottingham is our closest theatre that's where we see most of the shows. I love that it's just 30 minutes drive away and it's fairly easy to park too, we use the Trinity Car Park in Nottingham and walk to the theatre from there. All the world's a stage. Anyway, we booked our tickets and it was a 5pm start. This meant we had to head straight to the theatre from school (after the boys got changed) and we had dinner after the show. There were a few complaints from LP but he soon settled down when the show began. Wednesday Addams, the ultimate princess of darkness, is all grown up and has a shocking secret that only Gomez knows. She's fallen in love with a sweet young man from a respectable family. With his cherished Morticia in the dark will Gomez manage to keep his daughter’s secret until the two families meet for a fateful dinner with hilarious consequences? Join them, plus Uncle Fester, Lurch, Pugsley and more for a heart-warming story of love, family and friendship… with a twist! I wasn't sure what to expect, I watched the movie years ago, when I was about BP's age, and didn't really see how that could be a musical. Hubby was the one to book it and he assured me it was meant for kids and it would be entertaining. I had no idea what the story would be but as Cameron Blakely, who played Gomez Addams, came onto stage and began singing I couldn't wait to find out. Fester Addams came onto the stage and I was sure I recognised him. It was more his voice, something about it that I recognised that I couldn't quite put my finger on. I spent the whole show trying to figure out who the actor was who played Fester and it wasn't until I went to the website that I found out it was Les Dennis. Of course it was! Les did an amazing job, he got a few laughs and the boys loved his character. During the first half of the show LP couldn't sit still. Top Tip: Take your kids to the toilet before the show begins! From about 10 minutes in he was unable to concentrate and when the intermission began he wanted to dash off. Despite his distraction though he did say he enjoyed the first half. With these kind of shows I never tend to expect much from the vocals, I don't know why but I feel like they often don't have great singers. In The Addams Family that certainly wasn't the case. Cameron Blakely was great, Samantha Womack, who played Morticia Addams, was good, but Carrie Hope Fletcher (Wednesday Addams) was amazing. When she started singing my jaw dropped and I looked at the Hubby and whispered "wow, she's really good! ", the Hubby nodded. Carrie had a few good songs and she didn't drop a note, I was very impressed. It's always nice to hear great singers live, especially when that's paired with a performance and I have to say that whenever Carrie was on stage were my favourite parts of the show. We bought the boys an ice-cream during intermission, which is becoming a bit of a routine now as we've done it every time we've visited. It's good though, the boys get to have a treat and are really good afterwards. As the second half began the boys were sitting quietly waiting and we were all smiling. The second half of the show seemed to be over more quickly but it was just as enjoyable. I think LP enjoyed it more having emptied his bladder and when we came out both boys were smiling and chatting enthusiastically. Theatre just fills me up so much. The Addams Family is a great show for kids and adults alike, there are jokes that the kids won't understand but there are also ones to make them laugh too. This is definitely a family show! It's on tour at the moment, playing in Southampton at the end of July and heading around the country. We're heading back to the theatre soon to see Around the World in 80 Days, check back soon to find out what we thought. What is your favourite musical?